I’ve only read a few books by Miss Read although I’ve been familiar with the books for donkey’s years. In the past I had to censor books from the library for my mother-in-law and her mother as they were very genteel ladies and easily shocked, but I knew I was on safe ground with Miss Read books and I could safely give them to my m-i-l, who had led such a sheltered life that she was over 60 before she realised what the ‘eff’ word actually meant! Anyway, I decided to read this omnibus of Christmas and winter season books and short stories to try to get me in the mood for the festive season. They’re all from her Fairacre series and mainly revolve around the village school and although I always thought of these books as being twee in the extreme, the storylines often deal with quite serious subjects, such as disturbed children from dysfunctional backgrounds. In fact they are good depictions of the life of a teacher, as of course teaching is just one part of the job, they end up being unpaid social workers and nurses too. 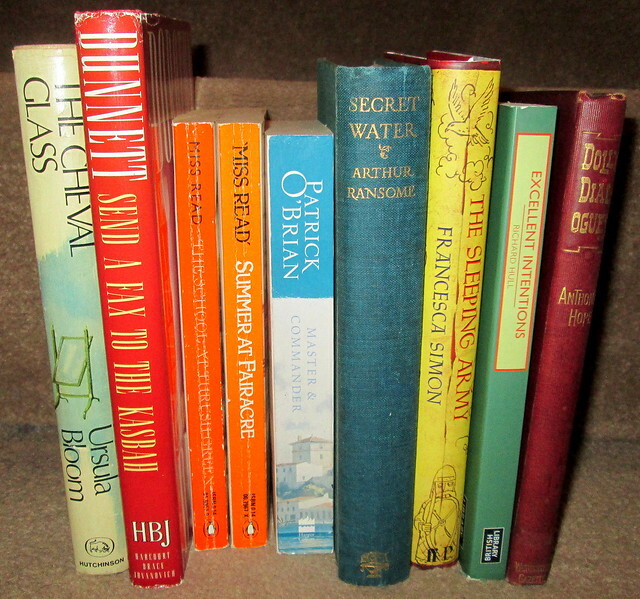 The novels and stories span the years from 1949 – 1979. In a way these stories did help me to get in the mood for Christmas, which is just as well as it’s very soon now. They are well written and observed from Dora Saint’s (Miss Read) own experiences as a teacher, but I think they’re seen as being quite lightweight when they aren’t really. It’s what I call (I just typed that and realised that it makes me sound exactly like Miranda Harts’s mum! ho hum) – it’s what I call Waltons Syndrome, as The Waltons was a by-word for schmaltz and sentimentality when in actual fact if you ever watched it you’ll realise that it was far more realistic than that. The family members were often at daggers drawn and even Grandma and Grandpa were more often than not at war with each other and wouldn’t even be on speaking terms. I read this as part of Judith@ Reader in the Wilderness Christmas Open House If you click the link you’ll see some more Christmas book post links.